In archaeological contexts, textiles are relatively rare finds, especially in Mediterranean Europe where conditions are unfavourable for organic material preservation. 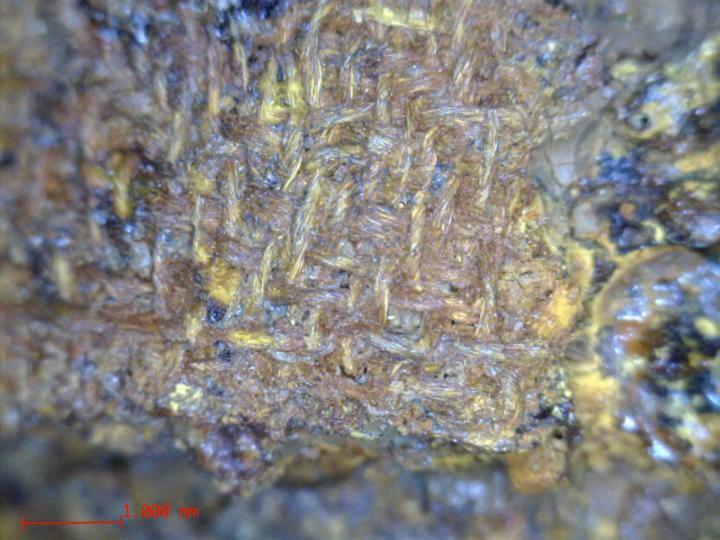 Many archaeological textile fragments do, however, survive in mineralised form, which forms the basis of a new study published today in Antiquity. According to Dr Margarita Gleba, the study's author and researcher at the McDonald Institute for Archaeological Research, University of Cambridge, "Luckily for us, during the Iron Age (c. 1000-400 BC) people were buried with a lot of metal goods such as personal ornaments, weapons and vessels. These metals are conducive to the preservation of textiles as the metal effectively kills off the micro-organisms which would otherwise consume the organic materials, while at the same time metal salts create casts of textile fibres, thereby preserving the textile microstructure." "This is how we get such a large number of textiles, even though they only exist now in tiny fragments. Through meticulous analysis using digital and scanning electron microscopy, high performance liquid chromatography and other advanced methods we are able to determine a lot of information including the nature of the raw materials and structural features such as thread diameter, twist direction, type of weaving or binding, and thread count." Dr Gleba added, "There is overwhelming evidence for frequent contact between Italy and Greece during the first half of the first millennium BC, but this evidence shows that their textile traditions were technically, aesthetically and conceptually very different. This means that the populations in these two regions are making an active decision to clothe themselves in a certain way and it may have to do with traditions set up already in the Bronze Age." "Textiles have been and still are widely considered one of the most valuable indicators of individual and group identity. Even in societies today, we frequently form opinions of others based on the type of cloth they are wearing: tweed is associated with Irish and British country clothing, cashmere with Central Asia and silk with the Far East for example." "Curiously, by Roman times, the establishment of Greek colonies in southern Italy and more general oriental influences observed in material culture of Italic populations leads towards gradual disappearance of the indigenous textile tradition. Our future research will attempt to understand the cause behind this change in textile culture."